Is this a good implementation of the repository pattern? The _transaction in the database implementation shall be intended as the Unit of Work. 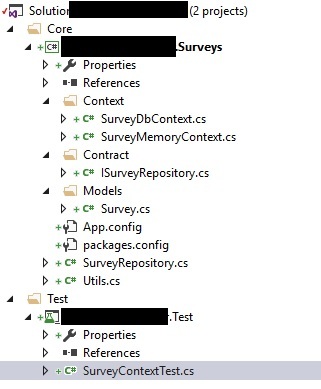 Unit tests on the db could be done by creating a separate class (SurveyMockDbContext) that does everything as the normal DbContext except it always rolls back everything. Is this a principle of Dependency Injection, since the constructor of the SurveyRepository class takes in an interface to perform operations, without actually knowing who's really acting? Is this actually production code, or does it belong in your Test project because it allows you to run tests without hitting an actual database? Either way, I'd consider changing it to a Dictionary<int, Survey>, keyed on the Survey.Id, since Id is your main search criteria. What happens if an invalid Id is passed into delete? It seems like it should at least return the result of _surveys.Remove(deletingSurvey). Your unit tests feel a bit incomplete. A lot of them don't really seem to test very much. For example DeleteExistingSurveyReturnsTrue could be made to pass by stubbing SurveyRepository.Delete to always return true. There's no counter test to validate that passing a non-present Survey would return false (or throw an exception or ...). The test GetByIdReturnsTheExistingSurvey simply checks that GetById returns a non null Survey. It doesn't check that the right survey has been returned (at a minimum I would expect it to check that the Id of the survey requested matches that of the survey returned). When you're writing your tests consider what the minimal implementation needed to make all of your tests pass is. If you could get away with having a series of return true, return new Survey etc methods then you might want to rethink the value of the tests. It seems like _command should really be a local variable, rather than a class member, unless you've got another use case you haven't implemented yet that requires it at the class level. This will probably be ok, depending on how long lived your context is likely to be. If your DbContext is going to be a long lasting instance, then it's worth considering how you want your application to behave / recover if the database connection is closed. P.S. I would suggest to have a look at SRP, Identifing Relationship and Cascade Delete. Not the answer you're looking for? Browse other questions tagged c# asp.net repository or ask your own question.